Note: We generally don’t publish hints that pose serious physical risk - and, we advise our readers to consider the ramifications of any of these practical jokes before you implement them. 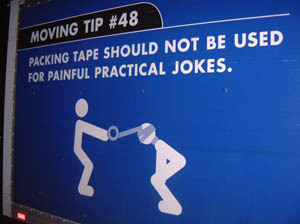 Also, please note that when you post your ideas here, you are granting Octane Creative and the Duct Tape Guys permission to publish your practical joke triumphs. 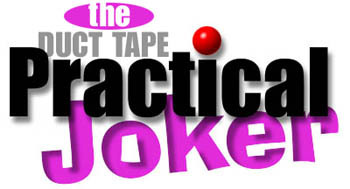 While you are at it, check out Tim's new book, The Practical Joker's Handbook - click the cover on the left. The Duct Tape Wall. This works well for college pranks and in general with doors that open inward to the poor person being trapped inside. Cover the entire doorway (or at least a significant amount of it) with duct tape so that when the occupant inside opens thier door all they see is a sticky wall of duct tape they must get through somehow. A funny 'Got ya' sign stuck to the inside of the wall before the the walls completion also adds some humor. Carcooning Gather a lot of cling wrap and a lot of duct tape (*remember if you spare the duct tape you spare the job or prank). Next One wraps their "victims" car in the cling wrap (so you don't apply the tape directly to paint) then uses the duct tape to wrap the car in a sort of duct tape cocoon. It works and you just sit back and laugh while it takes them forever to get there car out. --- Blame Mark from W.Va.
Bathroom Water Issues Go to one of those bathrooms that have sensor toilets and put a peace of duct tape over the sensor so that toilet never flushes,or put it over the sensor on the sink so the water is always on. --- Blame Kyle H.
Shower Surprise Ingredients: Duct tape, plastic bag, shower head, and victim. You have to stay up late and make sure you don't wake up your victim. take the plastic bag and tape it around the shower head. (make sure it is on tight) Then just wait for the unexpected person toTRY to take a shower. --- Blame Brady W.
Desk Drawer Dilemma Duct tape is real handy for driving your co-workers, or better yet, your boss, nuts. Only a few feet are needed to tape someone's center desk drawer shut around the edges of the two sides and the back. It's doubly exciting if the drawer is just slightly open so that the victim can tell that the drawer can't be locked, but can't immediately see or feel what is holding the drawer shut if the tape doesn't cover the entire length of the drawer. At the same time it doesn't do any permanent damage to the furniture. Works best in conditions of reduced light. Avoid doing this to anyone who may have a bad back. The drawer pulling response can get really vigorous. - Blame goes to Charles S.
Sink Sprayer Shower This idea was sent anonymously (the boss still doesnt know who did it). Every morning the boss gets to work about a twenty minutes before the other employees and puts on the coffee. Before leaving the office the previous night, the prankster took a small strip of black duct tape and taped the sink sprayer handle in the on position and aimed the sprayer so it would hit the boss square in the chest. The next morning, the employees were welcomed by their boss sporting a huge water mark on his suit and a big you got me grin on his face. Tire Sniper Get some Bubble Wrap® with one inch bubbles (at most office supply stores or in dumpsters behind gift shops). cut a strip about a eighteen inches long and the width of a tire. Tape this to the tread of the front wheel of a parked car. When the car starts moving, the resultant popping sounds like a machine gun. Frame A Friend Sometimes when you buy used videos from Blockbuster, they still have the little theft strip on them. So if you ever want to get someone good, just remove theft strip and duct tape it to the bottom of their shoe, then send him on a run to the video store.Works great! - Blame goes to Randy M.
For more practical jokes click here.